On 2nd September 2010, the skip that was located at the LOFAR field site was removed and brought back to the main Observatory compound. 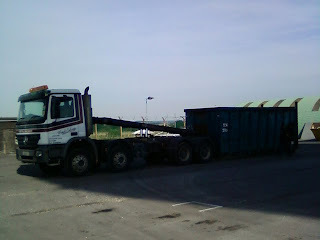 From there, it was loaded with a few more items which needed disposing of from there. However there was very little waste to be removed. Caption : Here the skip is about to be loaded onto the lorry for the last time before leaving the site.